With rampant speculation about North Korea conducting another nuclear test in the near future, it is important to examine not only the technical aspects of the September test, but how it was communicated to the North’s allies—China and Russia. As such, it appears that key North Korean officials were dispatched just days before the test, who seem to have provided advance warning to Beijing and Moscow. These visits were preceded by a number of unannounced, senior-level personnel changes within the Foreign Ministry, perhaps in an effort to improve the North’s troubled relations with the international community. The personnel changes began in May at the end of the 7th Party Congress, when incumbent Foreign Minister Ri Su Yong (also known as Ri Chol) was elected as Workers’ Party of Korea (WPK) Vice Chairman and Director of the WPK International Affairs Department. Ri Yong Ho, a veteran diplomat and former Six Party Talks negotiator, assumed Ri Su Yong’s old role and became the first North Korean Foreign Minister born after the DPRK was founded in 1948. Ri Yong Ho was also elected as an alternate (or candidate) member of the WPK Political Bureau, one of the DPRK’s top power organizations. Ri Yong Ho’s promotion to the Foreign Ministry’s top job opened up one of the office’s half-dozen Vice Foreign Minister positions. That vacancy was filled in August by Han Song Ryol, who had directed the Foreign Ministry’s Institute for American Studies since January 2013. In his earlier capacity as deputy ambassador to the United Nations, Han was a fixture of the “New York Channel,” serving as a key interlocutor between the United States and North Korea. He participated in numerous bilateral and multilateral forums, including the Six Party Talks, and he interacted with private US individuals and organizations through Track II initiatives. Han Song Ryol’s promotion created an opening at the Institute for American Studies that was filled by the institute’s deputy director, Choe Son Hui. Like Han, Choe has participated in several official, off-the-record and Track II interactions with Americans over the years. In addition, Choe worked during the Six Party Talks as a notetaker for Kim Kye Gwan, who is currently the First Vice Minister of Foreign Affairs, and as an English interpreter during visits to Pyongyang by former US Presidents Jimmy Carter and Bill Clinton. She also acted as Jang Song Thaek’s interpreter at a February 2013 banquet hosted for Dennis Rodman. Ri Yong Ho’s appointment to Foreign Minister and the career advancements of Choe and Han represent continuity in the Foreign Ministry’s interface with the United States. They each have decades of experience and have developed social contacts with Americans, both in and out of government. For the next US administration and for private actors pursuing Track II initiatives, these personnel changes mean that dedicated communication channels into Pyongyang will likely remain open and perhaps less mercurial than during previous interactions. A New Approach to China and Russia? With the personnel changes in the Foreign Ministry, it also appears that the DPRK has changed the methods through which it notifies China and Russia about upcoming nuclear testing activity. In the days leading up to the fifth nuclear test, the DPRK sent several representatives to Moscow and Beijing. While coming from seemingly divergent sectors of DPRK institutional life—from military and the Foreign Ministry—the nature of their positions indicates that each likely knew a nuclear test would occur while they were out of the country. As the fifth test drew close, two working-level delegations from the Workers’ Party of Korea (WPK) International Affairs Department were sent to both countries. On September 3, Vice Minister of the People’s Armed Forces Colonel-General Yun Tong Hyon departed for a weeklong visit to Moscow, ostensibly to attend ARMY-2016, a defense industry trade show hosted by the Russian Ministry of Defense. Colonel-General Yun is one of the Korean People’s Army’s (KPA) highest-level officials involved in missile and weapons development policy, with a focus on resource allocation and research, development and production. In the context of the DPRK’s nuclear weapons program, Yun is tasked with establishing a credible delivery system and thus, has fairly good access to Kim Jong Un. As such, he would have been part of a small cohort of military officials receiving status reports and other documents indicating that a test was imminent. 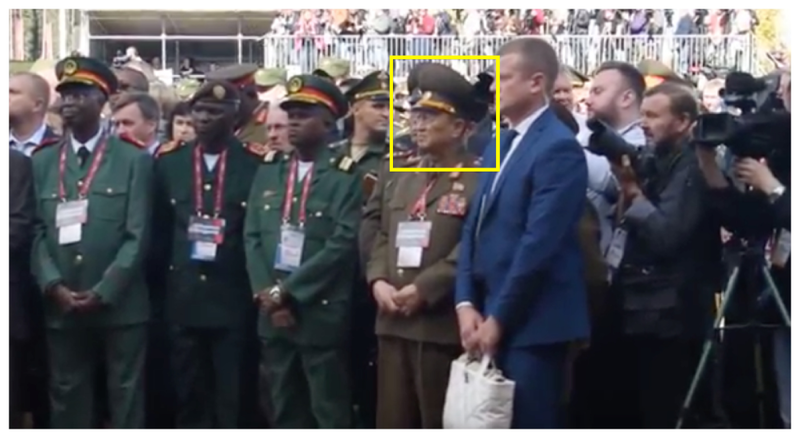 Yun had no public meetings with his Russian counterparts during his trip, and though he attended a couple of panel events, he was otherwise not observed visiting the exhibition booths and demonstrations at ARMY-2016. While Yun was in Russia, a deputy director of the WPK International Affairs Department also arrived in Moscow, presumably to disclose the test at the working level. Given this development, it is likely that Yun’s writ was to respond to the Russian reaction to the fifth test and take Moscow’s off-the-record message back to Pyongyang. It cannot be conclusively established when Colonel-General Yun was selected to represent the DPRK at ARMY-2016, but a June comment by one of his Russian counterparts suggests that Pyongyang may have seen Yun as a more ideal message bearer than a senior diplomat or government official. At the IISS Shangri-La Dialogue in June, Russian Vice Minister of Defense Anatoly Antonov remarked that “we find it absolutely unacceptable to try to use North Korea’s nuclear missile programs as a pretext to change [the] military and political balance in the region.” The DPRK may have interpreted such comments to mean that officials of Yun’s rank would receive a receptive audience from their equivalents in Moscow. On September 6, Choe Son Hui traveled to Beijing to meet with PRC officials, perhaps in part to provide an official response following the DPRK’s mobile missile drill on September 5. Like Colonel-General Yun, Choe presumably had direct knowledge that a nuclear test was in the offing. As a senior Foreign Ministry official, she would have been involved in the formulation of the DPRK’s official diplomatic responses to the nuclear test; thus, she would have been “read in” that a test would occur. According to the Asahi Shimbun, which cited a “source who is knowledgeable about Chinese-North Korean relations,” Choe informed her Chinese interlocutors that a nuclear test was going to happen. Chinese relations are not part of Choe’s portfolio, however she has participated in nuclear negotiations, including Six Party Talks. Two days after Choe left for China, a WPK International Affairs Department delegation led by deputy director Kim Song Nam also visited China. So, like Yun Tong Hyon, Choe’s visit to Beijing may have been about providing additional support to the working-level DPRK officials and perhaps taking China’s response and message back to Pyongyang. The Asahi account hits directly on the primary motivation of the all-but-certain deployment of Choe Son Hui and the highly probable dispatch of Colonel-General Yun for interactions with the DPRK’s allies around the time of the fifth nuclear test. Sending personal messengers and doubling external affairs gave North Korean officials the chance to remind their interlocutors that the deployment of the US-built Terminal High-Altitude Area Defense (THAAD) system to South Korea is a fait accompli. The Chinese and Russian governments have on numerous occasions expressed to Seoul their opposition to THAAD, even before plans for its deployment were finalized. The North’s fifth nuclear test presented an opportunity for Pyongyang to exploit this geostrategic rift between Seoul, Beijing and Moscow, also making it difficult for South Korea to announce “close coordination” with China and Russia after the test took place. The pre-test trips by Choe and Yun do raise questions about how North Korea informs its allies in Beijing and Moscow about upcoming nuclear tests. Whether this is a precedent that will continue is yet to be seen. It also raises the question of whether Pyongyang is demonstrating a new dynamic in relations with China and Russia, which have been tense since Kim Jong Un has assumed power in 2011. At the very least, they seem to signal that North Korea’s Foreign Ministry and its nuclear diplomacy are under new management. Han replaced another longtime US interlocutor Ri Gun, who was later appointed as the North Korean Ambassador to Poland in early 2014. Officials of the DPRK Foreign Ministry and the WPK International Affairs Department have previously complained about a lack of consistent foreign counterpart officials. One former senior official questioned whether it was worth it to the North to make an agreement with Japan due to the changes in the Japanese Cabinet. The Russian Ambassador to the DPRK saw Yun off at the Pyongyang airport. “Russia condemns ‘nuclear bomb test,’ ‘a threat to national security,” by Olga Gertcyk, The Siberian Times, January 6, 2016. “Russian Defense Ministry Warns Against Excessive Response to N Korea,” Sputnik News, May 6, 2016. The DPRK Foreign Ministry receives some advance notice about nuclear testing in order to plan the country’s official diplomatic responses after a test happens. This involves alerting selected DPRK Ambassadors stationed abroad, as well as crafting and disseminating Foreign Ministry statements transmitted through state media. Koichi Furuya. “N. Korean ally China told about nuclear test plan beforehand.” Asahi Shimbun, September 13, 2016. http://www.asahi.com/ajw/articles/AJ201609130063.html.